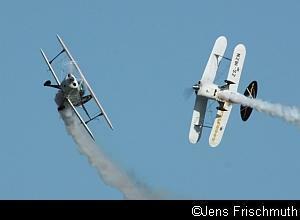 The 2008 Port Elizabeth Airshow took place on a sunny but windy Saturday on the 25th of October. The weather played along for the airshow - the rain that fell the previous day and night cleared in the morning and the spectators that attended the airshow were treated to flying displays under a clear blue sky. Crystal Watson and her team organised an outstanding event. Crystal is also a director of the M.R.T. Smit Children's Haven in Port Elizabeth, which provides accommodation for about 100 children between the ages of 3 and 18. The profits from the airshow were donated to the Children's Haven. 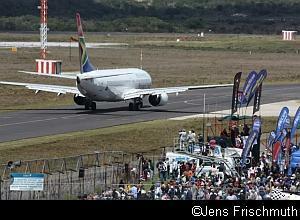 The airshow took place at a fully operational commercial airport and the airshow displays had to fit in with the arrivals and departures of commercial aircraft. This afforded the spectators the opportunity to see the passenger aircraft at close range as well. 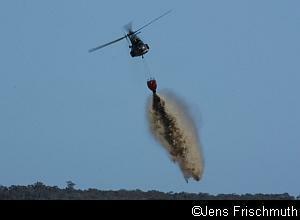 The South African Air Force (SAAF) contributed greatly to the success of the airshow. 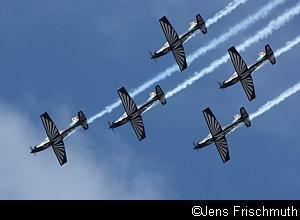 The Silver Falcons, the official display team of the SAAF, did two full displays in their PC-7 MkII Astras. The team is going through exciting times at present. Recently, they changed from a 4-ship to a 5-ship display team. The team also got their new identity with the launch of their new navy blue and white colour scheme at Africa Aerospace and Defence 2008 in Cape Town in September. The Port Elizabeth airshow marked the first performance of team 69, with Capt Roy Sproul as the newcomer in the number 2 position. The SAAF also flew a C-47 Turboprop Dakota from 35 Squadron and demonstrated the full flight envelope of this trustworthy old bird. A CASA 212 demonstrated its short take-off and landing capabilities as well as excellent low-level flying. Port Elizabeth is the home of Stu Davidson and his son Patrick, who have their own private collection of aircraft. They were out in full force during the day with no less than four of their aircraft. Stu showed off his L-39 Albatross ZU-DEW and also flew two displays in the T-28 Trojan, which made its public debut at the show. 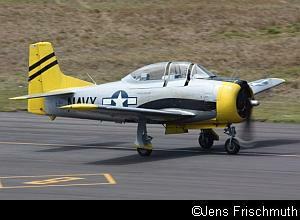 Patrick flew the North American AT-6 Harvard and flew two high impact aerobatic displays in the Extra 300. Also from Port Elizabeth is Dave Mandell, who entered the South African airshow display scene earlier this year. He displayed his own L-39 Albatross ZU-KIM to good effect. Neil Trollip, Dennis Spence and Glen Warden of the WesBank Goodyear Wizards performed two superb displays of precision close flying, synchronised rolls and hair-raising head-on passes in their Pitts Specials. The South African Air Force Museum displayed its Harvard number 7480, which is based at its Port Elizabeth branch. This plane is still in its original day-glo colour scheme from its airforce days. The Harvard served as the ab initio trainer in the SAAF from 1952 to 1995. The Netcare 911 Rescue Team and Police Task Force demonstrated their capabilities by staging simulated rescue and hijack scenarios.